Eindhoven, the Netherlands – Today it was announced that the Lirio by Philips Balanza consumer lighting range won one of the coveted Gold awards at the iF awards ceremony in Munich, Germany. The iF awards, covering product, material, packaging and communication design, are a recognition of international design excellence. The Balanza range includes a floor lamp and a table lamp. The choice of materials, the shapes and proportions are contemporary, but reflect an iconic shape. The design balances the extra matt finish and the sand-blasted glass plates that create the warm, diffuse light. In addition to this Gold award, Philips won a record-breaking 31 iF awards across the different design categories, of which 9 of them for consumer luminaires. See the press release for more details. 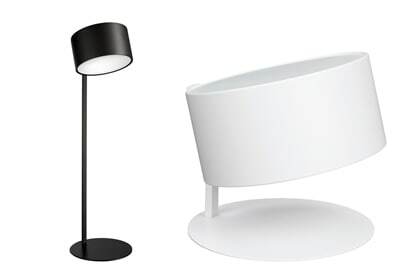 Click here to download high res images of the Lirio by Philips Balanza range. As a ‘seal of good design’ and known throughout the global world of design and beyond, the iF product design award honors outstanding achievements in design. An internationally renowned jury, consisting of 44 design experts, engaged in a critical discussion and debate to select the winning products. Only 100 Gold Awards are selected from all the iF award winners. All prize-winning products will be presented at the iF design exhibition in Hanover, Germany from March 6 - 10 and in Hamburg in the second half of 2012. More information can be found at www.ifdesign.de. The Lirio brand was acquired by Philips in 2007 and offers a range of decorative premium consumer luminaires. See www.lirio.eu for more information.